If you like the idea of planning an extension that's designed to maximise natural light, our clever design tips and tricks are here to help ensure that your space feels as large and bright as possible, covering everything from roof lanterns that raise ceiling height to contemporary slim-frame windows and tips for keeping a light-filled extension cool in the summer. Use these light filled extension design ideas to help plan plan your project, and find out more about extending a house in our ultimate guide. 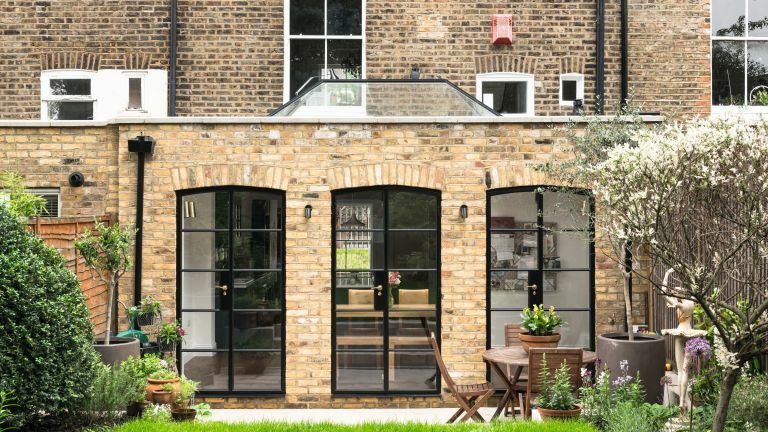 There are a couple of options available when designing a glass extension: either a classic style that matches your home's aesthetic or a design that dramatically contrasts with the building, adding interest and individuality to the architecture. Listed or period properties suit an orangery-style design or a conservatory or sunroom, which are often sympathetic to their original features. This said, modern glass extensions are a popular option for extending a terraced house. Take a look at our gallery of striking glass extensions for inspiration. If you've inherited a flat roof extension from a former owner, adding a roof lantern is the best option for raising the height of your ceiling while making your space feel larger and lighter. For a contemporary feel, and to ensure it allows in as much daylight as possible, choose one with slim and minimal framing and pared back detailing. Ensure it matches any doors to the garden, too, for a cohesive look. In addition to thinking about how much light you'll be gaining, it's important to think about what effect your windows will create visually from the indoors. For example, evenly-spaced windows will be more pleasing than unevenly-spaced ones, while slimmer frames will be less obtrusive than chunkier ones. Read our guide to buying metal doors and windows to get a look like this, below. If you've opted for a contemporary glass extension, either to tie in with the modern style of your home or to contrast a period property, it's worth considering slim-framed expanses of glass that will give uninterrupted views of the sky. This is also a great option for maximising light. Bear in mind that several, smaller pieces of glass will be cheaper than one large piece. And if you're on a tight budget, classic Velux windows will have a similar effect from indoors, but will save you a small fortune on bespoke glazing. Even with solar-control coatings, heat can build up in a room with a lot of glazing. With this in mind, it's worth ensuring that your windows are fitted with remote control fittings that allow you to open and close them easily. When you extend a room, you need to come up with ways to get natural daylight into the recesses of the extension – in other words, into the back of the original room that you've extended. The best way to do so is with top light, which is brighter than light that penetrates through windows and doors. It will be particularly effective in a south-facing extension, but even north-facing additions will benefit from rooflights. Read our guide to choosing rooflights to ensure you make the right choice for your extension. Light wells or skylights are the most obvious way of introducing light and ventilation into a basement. There are potential planning issues – notably within conservation areas – but there are design solutions for most situations. A small opening with a walkable grill over it can make a big difference to the feel of a basement space, and add real value. Larger openings can have a protective covering in toughened glass. Find more ideas and information in our guide to converting a basement. If your extension is a new kitchen diner, introducing mirrors as splashbacks is a clever way to bounce light around in a way that doesn't look contrived. And, of course, if yours is a living space, hanging a large wall mirror will have the similar effect of bouncing light around the room. If you want your room to feel light-filled, even if it's somewhat light-starved, the easiest way to do so – and by far the cheapest – is to decorate it as if it were a north-facing room. That means light-coloured, reflective or transparent surfaces (in the case of a kitchen, particularly the flooring and the worktops and cabinet fronts); good lighting and a clutter-free approach. Read our guide to designing a north-facing room to look light and bright to get all the advice you need. We love a spot of statement glazing, and this stunning side return extension has certainly captured our attention. Glass works best in a barely-there style, so we love the wide expanses of glazing and the boldly executed roof. The exterior packs a punch thanks to the contrast of traditional brickwork and sleek black-framed finish. Most of all, though, we’re sold on the window seat. Picture chilly autumn nights curled up with a cushion, a glass of wine and a blanket... bliss. A similar extension would cost around £70,000. Yard Architects.